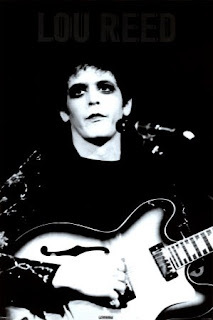 Perfect day by Lou Reed (image credit) is one of the most surprising songs I know. Who would have thought that the rock and roll animal would be capable of writing and recording such a tender ballad about a lazy summers day? Although admittedly there some darker undertones in the lyrics ("You're gonna reap just what you sow...") as well, suggesting links to drugs use. The 1972 album Transformer, produced by David Bowie, yielded this masterpiece. Melody, instrumentation, lyrics, all are rather simple, but the total result is breathtaking. Somehow I feel cheated that this little known gem suddenly became public domain courtesy of the 1997 cover by a street-load of artists each singing one line - the line-up varying wildly from Lou Reed himself, Bono and David Bowie on one side versus the likes of Boyzone and Tammy Wynette on the other side.